Ghibli Blog: Studio Ghibli, Animation and the Movies: 3000 Leagues in Search of Mother (Marco) Fansub Now Available! 3000 Leagues in Search of Mother (Marco) Fansub Now Available! Excellent news, everybody! 3000 Leagues in Search of Mother, aka Marco, is now available for download. Yes, English subtitles are included! Just head down to the Download section and begin downloading. The 1976 World Masterpiece Theater series is an anime masterpiece. 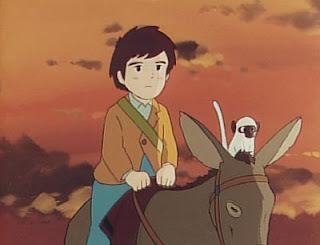 The brainchild of Isao Takahata (director), Hayao Miyazaki (layout, continuity), and Yoichi Kotabe (character design), Marco is the second of three classic television series of the 1970s, both directed by Takahata-san - 1974's Heidi, Girl of the Alps; 1979's Anne of Green Gables. This middle series is the most complex, and most emotional of the three. Heidi paired exuberant energy with high melodrama; Marco scuttles the niceties and goes straight for the heart. I think 3000 Leagues is the richer experience; the tragedy of Marco's suffering, and his endless search, becomes an archetype for man's search for meaning. It achieves an epic grandeur. At its heart, this is a deeply Jewish story. You almost expect God to appear at the end and deliver his speech from the Book of Job. Once again, Neo1024 delivers the pot of gold at the end of the rainbow. One request: could you break up the torrent into smaller downloads? 14GB is probably going to be too much for many people. Smaller file sizes would enable faster downloads and help make sharing easier. I do _like_ your blog. Thanks for keeping it alive. @anon: That's great advice. Thanks! Maybe Heidi will be next? it's really hard to get Ghibli's work in my country (Indonesia)..
i've been always a Ghibli big fan, and recently i find everyone in here seems start to know Ghibli. No, splitting the torrent is not an option, since BakaBT (mainly) does not allow partial torrents. The advice above is the best bet for getting the torrent in batches. I'd like to get just the subs (SRT files) ¿anybody knows if they are available somewhere? Hopefully this is not an inappropriate place to post this - but I have been trying to download the Future Boy Conan fansubs. The first 9 episodes downloaded without trouble, but I'm now having difficulty with some of the remaining episodes. I am 91% finished episodes 10-12, but they are moving extremely slowly. . . and none of the other episodes are downloading at all. Particularly concerning are episodes 16-18. . . I have been connected for I believe almost 24 hours and I'm still at 0%. If anybody has downloaded these episodes and could reseed them, it would be most appreciated! I can't wait to watch the rest of the series! I'm using uTorrent, and I keep getting an error that there's not enough disk space and it stops downloading. Anyone know how to fix this? I tried deleting some stuff but it keeps popping up. I've tried limiting to the first five episodes and it still says the 'no disk space' error. Maybe it's just my computer? @greentea: That's quite a puzzle. I've never encountered such errors whenever I've used torrents. Have you checked your hard drive to see if there is space? Using BitTorrents are easy. You just download a BT program (a client). Once that's installed, you treat the torrent like any download. uTorrent is the program that I use. Hope that helps - good luck! Hi, I'm new to torrents downloads, and currently I am using BitTorrents and it just stopped downloading. When I look into the info, it says there is 0 peers. Does that mean that there are no sources I can get this from? Is there any way around this? Thanks! i'm so, sooo happy for finally get a chance to have this!!!! thanks a lot for the upload, i'm searching for Marco for years! BTW, very nice blog! loved it!